I spend my Sundays catching up on bad television, magazines and– most importantly– housework. It’s times like these I remember, and often re-open, the end-all-be-all of households texts; the motivation behind an ode to said book in Reviewing the Arts homework (ahem) and the amazing surprise wrapped in birthday paper months back is none other than the amazing Martha Stewart’s Homekeeping Handbook. Bow in its glory… Or at least sheer mass, because seriously– it’s a giant book. 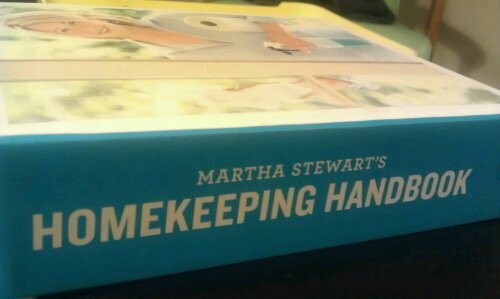 Saying Martha Stewart’s Homekeeping Handbook is an amazing book is arguably like saying your favorite read is The Merriam-Webster. Everyone knows the importance of the dictionary; Martha’s masterpiece is just the same. Love her or hate her, Martha knows her stuff when it comes to keeping house. Within the book’s 744 pages, she (and her team, whom she gives ample credit to early in) answers any homemaker’s conundrum with logical progression and organization of topics. While I may not have finished the entire thing– I don’t have a garage, therefore I don’t need to read about one– I’ve read a lot of it, and it is good. The main chapters are themed by room with additional sections for things like cleaning calendars, living with pets and emergency preparedness. Martha skips no detail; topics as large as how to set a table (broken into categories of formality, of course) to as small as drawer liner material (yes, there is more than the sticky plastic I’ve bought in years past; who knew?) are covered. The book is detailed to such a point that there is a 29-page “Materials Guide” that explains the basic history, care and storage of almost any solid surface imaginable. Did you know cloisonné should be stored in acid-free tissue paper? Did you know there is something called cloisonné? Exactly. Tucked into the margins readers can find small tricks, tips and ideas such as leveling a wobbly dining chair with a wine cork, flash chilling wine with ice water and protecting fine china with felt. The page layout and addition of small details like this keep the book from seeming too encyclopedia-like and lend itself to more of a personal notebook vibe. The addition of the large black-and-white photographs and a Martha-esque color palette (grey, cream, robin’s egg) not only aid in explaining points but in reminding readers they’re learning from one of the best. One of the most endearing qualities of the book, or even the concept of the book, is the idea of taking care of the home. With the assistance of this collection of tips, broken dishes can be reassembled, lamps can be rewired, furniture can be fixed and leather can be revamped. In many ways the modern world has ruined the thought of repair and throughout her collection of life lessons Martha has brought some of it back. Although it is arguable that a book like this is unnecessary in the Wikipedia age there is something classic and endearing about it being in print. While yes, topics such as keyboard and flat screen tidying are covered, many ideas haven’t changed much over the course of time. Any explanation of homekeeping and entertaining—outdated hobbies in the grand scheme of things— are more appropriate in printed form. Besides, Martha dedicated a whole chapter to home libraries, big and small. If the Mrs. Beeton of the modern day thinks books belong in the home, who are we to argue? Next Post Where is the coffee and why can’t I find socks?